Inaugural Trivia Quiz : It's All Politics How many presidents have chosen to affirm (rather than swear) to "faithfully execute the office ... "? Try your hand at inaugural trivia. 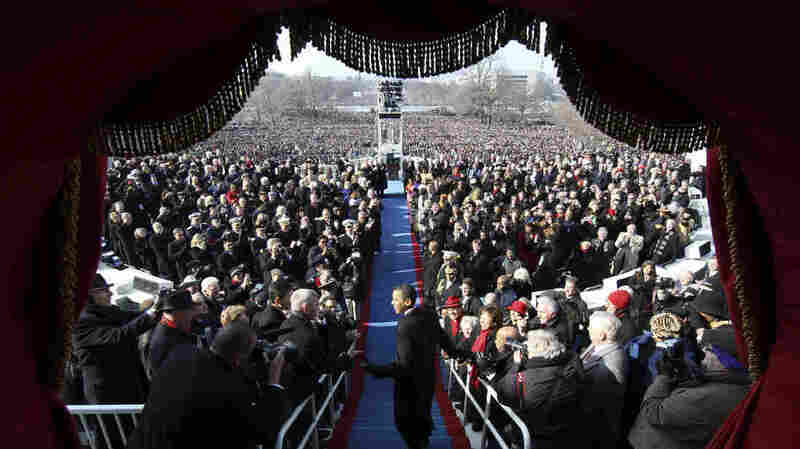 Barack Obama arrives at his 2009 inauguration to become the 44th president of the United States. See what you know about the wonkier points of the quadrennial festivities. Scroll to the page bottom for answers and explanations. 2) How many presidents have chosen to affirm (rather than swear) to "faithfully execute the office ... "? 3) In which state has a president NOT been sworn in? 4) On what date have most presidents been sworn in? 5) The shortest inaugural address was George Washington's second in 1793 at 135 words. Whose was the longest? 6) Where do the words "so help me God" appear in the Constitution? 7) President Obama had an oath do-over in 2009. How many times had that happened before? 8) Who organized the first inaugural ball? 1) The Constitution says that a presidency ends and a new one begins on: Jan. 20. The 20th Amendment, ratified in 1933, states that the vice presidential and presidential term "shall end at noon on the 20th day of January ... and the terms of their successors shall then begin." One, Franklin Pierce, in 1853, for religious reasons. The correct answer is Virginia. The first inauguration was in New York City. While most swearing-ins have been in Washington, D.C., eight times the vice president took the oath of office as chief executive after the death of a president. Several of those were in other states. On Aug. 23, 1923, Calvin Coolidge was sworn in as president at his family's homestead in Plymouth, Vt., after the death of Warren Harding. On Nov. 22, 1963, aboard Air Force One on the tarmac at Love Field in Dallas, Lyndon Johnson was sworn in after the assassination of John F. Kennedy. Most of the nation's presidents were sworn in on March 4. The 20th Amendment, ratified in 1933, switched the official date to Jan. 20. Franklin D. Roosevelt was the last president inaugurated on March 4, in 1933. He also was the first sworn in on Jan. 20, in 1937. 5) The shortest inaugural address was George Washington's second in 1793, at 135 words. Whose was the longest? William Henry Harrison's in 1841. Harrison was sworn in as the nation's 14th president on March 4, 1841. His speech, at 8,445 words, is the longest ever delivered at the occasion. While the Joint Congressional Committee on Inaugural Ceremonies says the estimated temperature was 48 degrees, the speech was delivered in overcast conditions with a cold wind. Harrison died of pneumonia after a month in office "believed to have been brought on by prolonged exposure to bad weather" during the inauguration, the committee says. They don't. While the words "so help me God" do not appear in the oath as mandated by the Constitution, Chester Arthur included them at the end of his oath in September 1881 after the assassination of President James Garfield. It has been custom ever since. Article II, Section I of the Constitution includes this: "Before he enter on the execution of his office, he shall take the following oath or affirmation: — 'I do solemnly swear (or affirm) that I will faithfully execute the office of President of the United States, and will to the best of my ability, preserve, protect and defend the Constitution of the United States.' "
7) President Obama had a do-over in 2009. How many times had that happened before? Before 2009, oaths had been redone twice, in both cases after the ascension of the vice president upon the death of the president, and both times because of questions about the validity of the original oath. It happened for Chester Arthur in 1881, after the assassination of James Garfield, and for Coolidge in 1923, after the death of Harding, who died of an apparent stroke. Dolly Madison, the wife of President James Madison, organized the first inaugural ball in 1809 as Madison began his first term.